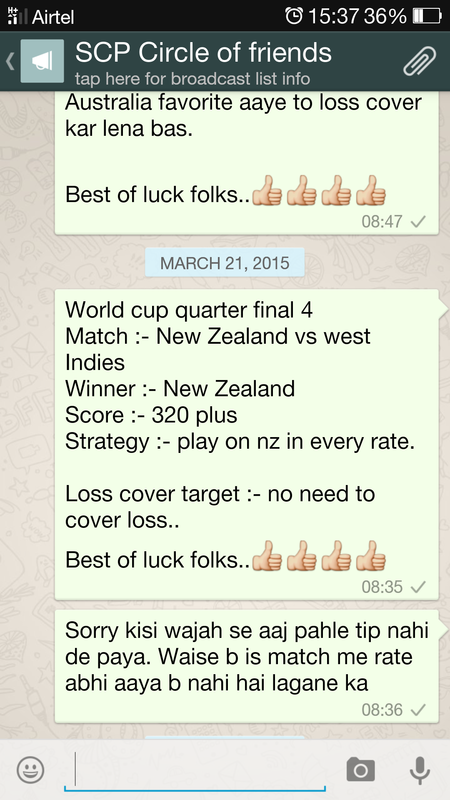 Ek taraf jaha khud ko bada tipster batane wale sabhi tipsters aur websites ne New Zealand ke Cup aur kal ka match jeetne ki report di thi wahi India ki sabse purani aur sabse RELIABLE WEBSITE SCPCRICKETTIPS NE WORLD CUP SURU HONE SE 2 MONTH PAHLE HI BATA DIYA THA KI IS BAAR WORLD CUP SIRF AUR SIRF AUSTRALIA WIN KAREGA. HUMNE APNE CLIENTS KO YE BHI BATA DIYA THA KI NZ, SOUTH AFRICA AUR AUSTRALIA SEMI-FINAL MEIN JARUR PAHUCHENGE BUT CUP AUSTRALIA HI WIN KAREGA. 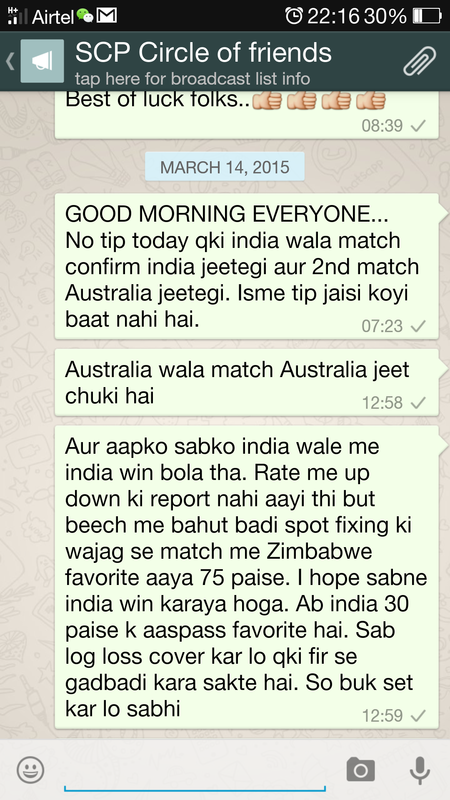 KAL KE MATCH MEIN BHI HUMNE SIRF AUR SIRF AUSTRALIA WIN KI HI TIP DI THI. Report ka screen shot hum neeche Post kar rahe hain. SABSE SPECIAL BAAT YE RAHI KI JAHA SABHI TIPSTERS WORLD CUP MEIN 70% ACCURATE REPORT BHI NAHI DE PAYE, WAHI SCP NE WORLD CUP MEIN 98% ACCURATE REPORTS DI. HUMNE 49 MEIN SE 47 RIGHT REPORT DI HAI. SABKE SCREEN SHOT PROOF KE LIYE WEBSITE PAR HAIN. AAP EK EK MATCH KE REPORT CHECK KAR SAKTE HAIN. DOSTO IS BAAR IPL MEIN BHI HUM APNI ACCURATE AUR SUCCESSFUL REPORTS KA SILSILA JAARI RAKHENGE. IPL MEIN BHI BAHUT ACCHI ACCURACY 85% SE UPAR JARUR DI JAYEGI. WORLD CUP MEIN HUMNE 5 JACKPOT AUR 5 SURE SHOT MATCH DIYE THE. IPL MEIN 10 SE LEKAR 15 JACKPOT MATCH ( JINME KUCH MATCH UNDER 10 PAISE KE BHI HONGE ) DIYE JAYENGE. FIVE TO EIGHT MATCH SURE SHOT BHI DIYE JAYENGE JINME LOSS COVER KARNE KI BHI JARURAT NAHI HOGI. IPL MEIN IS BAAR SESSION REPORT BHI HUM DENGE. 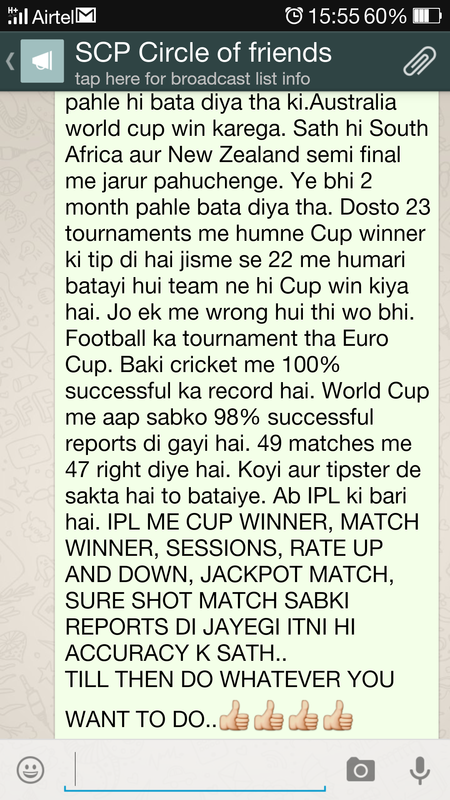 LAST 23 TOURNAMENTS MEIN SE 22 TOURNAMENTS MEIN HUMARI CUP WINNER REPORTS RIGHT RAHI HAI. IS BAAR KI CUP WINNER TEAM BHI HUM AAPKO IPL SURU HONE SE PAHLE HI BATA DENGE. HUMARI FEES SABHI TIPSTERS SE KAFI JAYADA HAI BUT EK BAAR YAAD RAKHNA …BAHUT PURANI KAHAWAT HAI. ..MAHANGA ROYE EK BAAR..SASTA ROYE BAAR-BAAR..
AGAIN RIGHT REPORT IN 2ND SEMI-FINAL..46 MATCH REPORT ACCURATE IN WORLD CUP’S 48 GAMES..98% ACCURACY..NOW IPL TIME..WE WILL GIVE 15 JACKPOT IN IPL AND SESSION REPORTS ALSO..
2nd Semi-Final mein bhi SCP ki report ekdum accurate rahi. 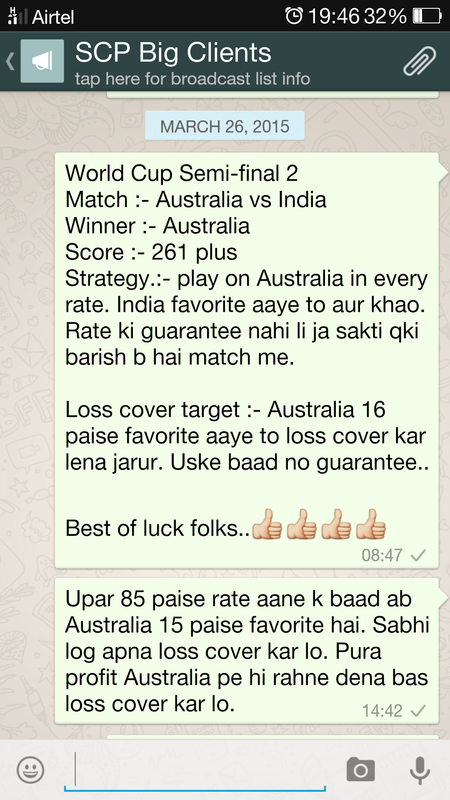 Humne Australia win ki report di thi aur match Australia ne hi win kiya. Report ka screen shot aap neeche dekh sakte hain. HUMNE WORLD CUP SURU HONE SE 1 MONTH PAHLE HI APNE SABHI CLIENTS KO BATA DIYA THA KI IS BAAR SEMI-FINAL MEIN AUSTRALIA, SOUTH AFRICA AUR NEW ZEALAND JARUR KHELENGI. 4TH TEAM KOYI BHI HO SAKTI HAI. HUMARI CUP WINNER TEAM BHI FINAL MEIN PAHUCH CHUKI HAI. 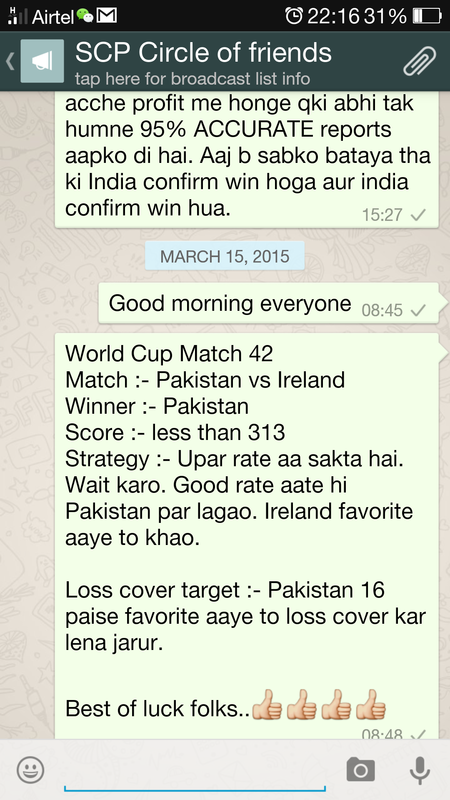 IMPORTANT NEWS :- DOSTO WORLD CUP MEIN HUMNE 48 MEIN SE 46 MATCHES MEIN RIGHT REPORT WITH SCORE DI HAI. SATH HI 5 JACKPOT AUR 5 SURE SHOT MATCH BHI DIYE HAIN. IPL MEIN BHI HUM AISI HI REPORT DENGE. 85% SE JAYADA ACCURACY KE SATH SATH 10 SE 15 JACKPOT MATCH BHI DIYE JAYENGE. 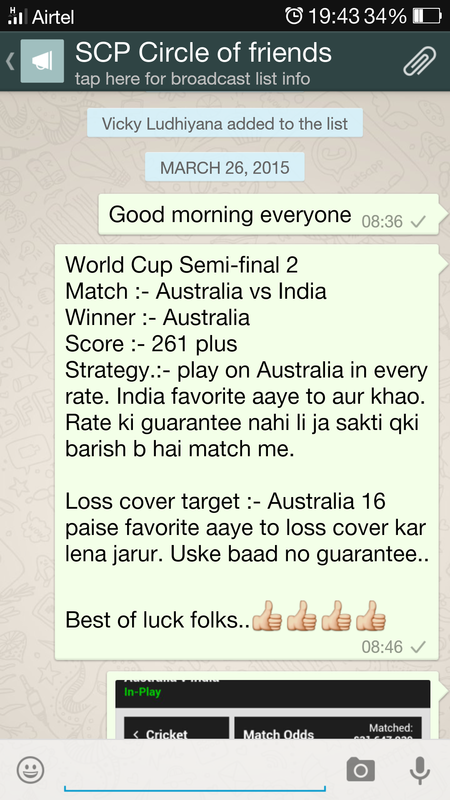 08 MATCHES MEIN SURE SHOT REPORT BHI DI JAYEGI JISME LOSS COVER KARNE KI BHI JARURAT NAHI HOGI. 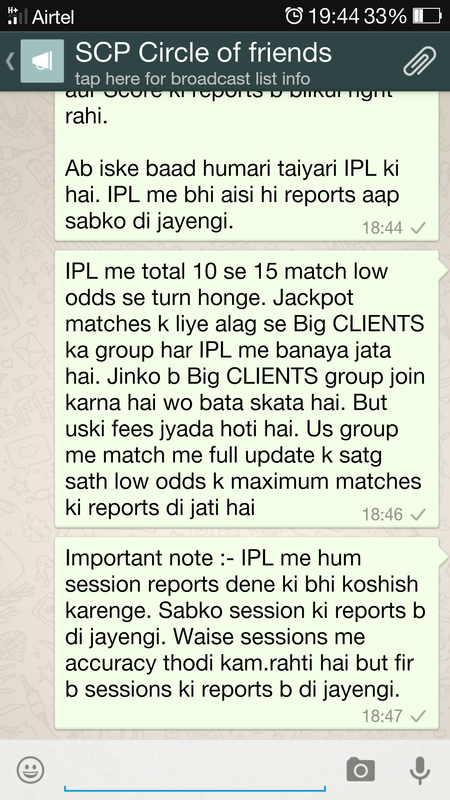 DOST ISKE ALAWA HUM IS BAAR IPL MEIN SESSIONS KI REPORT BHI AAPKO DENGE.. CUP WINNER TIP BHI DI JAYEGI. LAST 23 TOURNAMENTS MEIN HUMNE JIS TEAM KI CUP WIN KI TIP DI HAI, USI NE CUP JEETA HAI YA WO FINAL MEIN JARUR PAHUCHI HAI. JACKPOT REPORT IN FIRST SEMI-FINAL..NZ WON AS PER OUR REPORT..
World Cup ke First Semi Final mein ek baar fir se SCP team ne Jackpot report apne clients ko di. 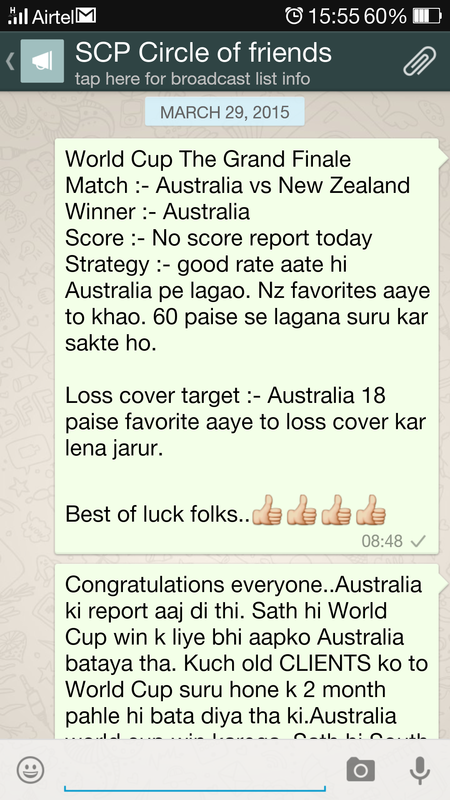 Humne aaj ke match mein New Zealand win ki report apne clients ko di thi. Sath hi humne ye bhi bataya tha ki South Africa is match mein 30 paise favorite aa sakti hai magar match New Zealand hi win karega. Match mein bilkul aisa hi hua aur South Africa 30 paise favorite aakar match haar gayi. Report ke screen shot aur humare clients ke reaction hum neeche post kar rahe hain. Aap dekh sakte hain. 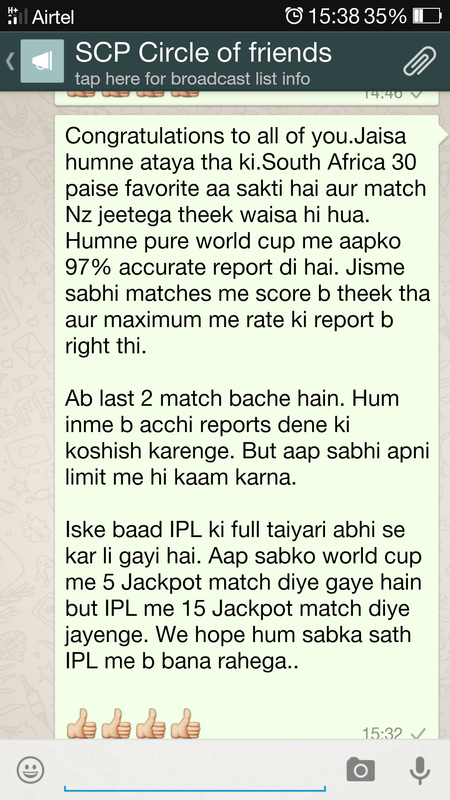 IMPORTANT NOTE :- WORLD CUP MEIN HUMNE AB TAK 98% ACCURATE REPORT DI HAI JISME 5 JACKPOT MATCH BHI THE. BUT WORLD CUP MEIN AB NEW CLIENTS KO ADD NAHI KIYA JA RAHA HAI SO AAP SABSE REQUEST HAIN KI ABHI HUMNE PHONE NA KARE. WORLD CUP FINISH HONE KE BAAD IPL KA PACKAGE SURU HOGA. TAB AAP SCP KO JOIN KAR SAKTE HAIN. IPL PACKAGE LENE KI LAST DATE 05 APRIL RAHEGI. 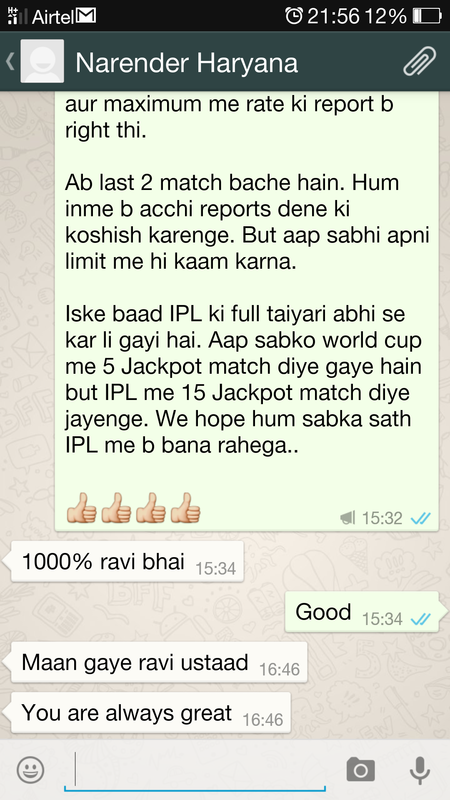 IPL MEIN 15 JACKPOT MATCH REPORT DI JAYENGI. 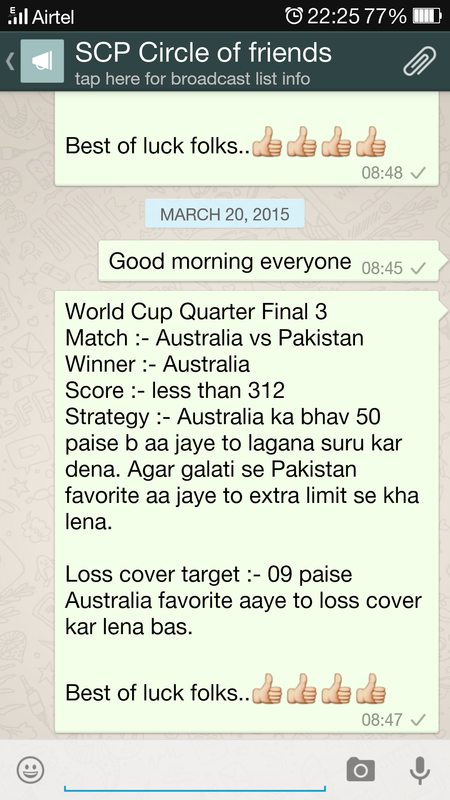 IMPORTANT NOTE :- ISSE PAHLE 4TH QUARTER FINAL MEIN BHI HUMARI REPORT RIGHT RAHI THI. 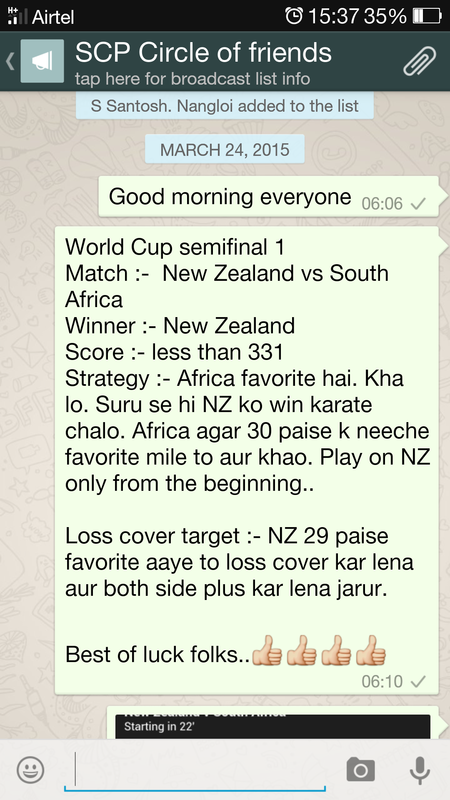 HUMNE NEW ZEALAND AUR WEST INDIES KE MATCH MEIN BHI NEW ZEALAND WIN KI REPORT DI THI. AUSTRALIA AND INDIA WON THEIR MATCHES AS PER OUR REPORT..
World Cup Quarter Final 2 India vs Bangladesh aur Quarter Final 3 Australia vs Pakistan dono match mein humari report bilkul accurate rahi. 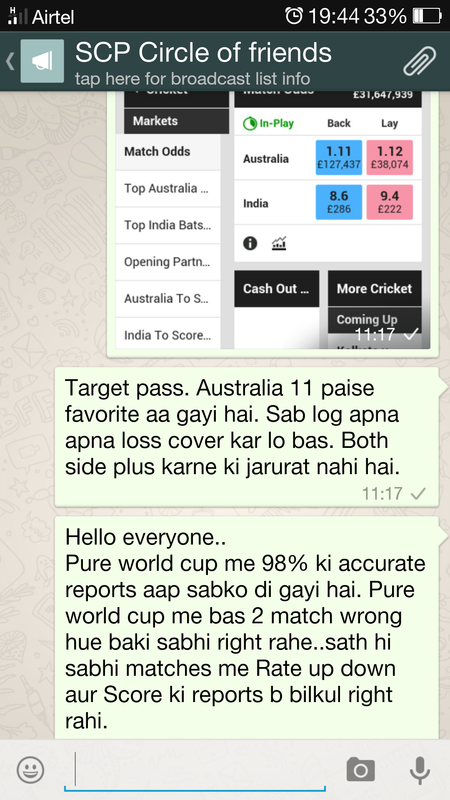 World Cup mein humne 98% accurate report di hain .. Dono matches ki report ka screen shot hum neeche upload kar rahe hain.. IMPORTANT NOTE = IPL MEIN WORLD CUP SE BHI BADA DHAMAKA KIYA JAYEGA. WORLD CUP MEIN HUM ABHI TAK 5 JACKPOT MATCH DE CHUKE HAIN BUT IPL MEIN 15 JACKPOT MATCH REPORT DI JAYENGI JINME SE 3-4 MATCH UNDER 10 PAISE SE PALATANE WALE BHI HONGE. 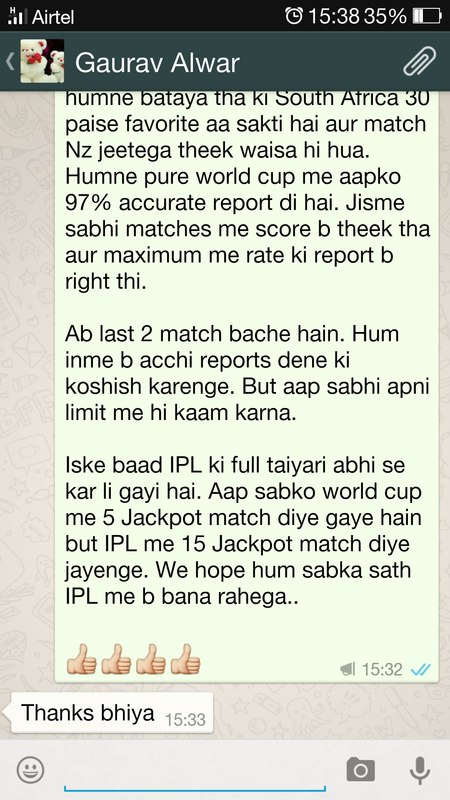 BUT IPL KA PACKAGE TIME 5 APRIL TAK HI RAHEGA..
SOUTH AFRICA WON AS PER OUR REPORT..5 JACKPOT IN WORLD CUP TILL DATE..98% ACCURACY..WE WILL GIVE 15 JACKPOT MATCH IN IPL..
World Cup mein humari 98% accurate report ka silsila jari hai. Abhi tak humne World Cup mein 98% matches mein right report di hai aur Aaj wednesday ko hue first Quarter-Final mein bhi humari report accurate rahi. 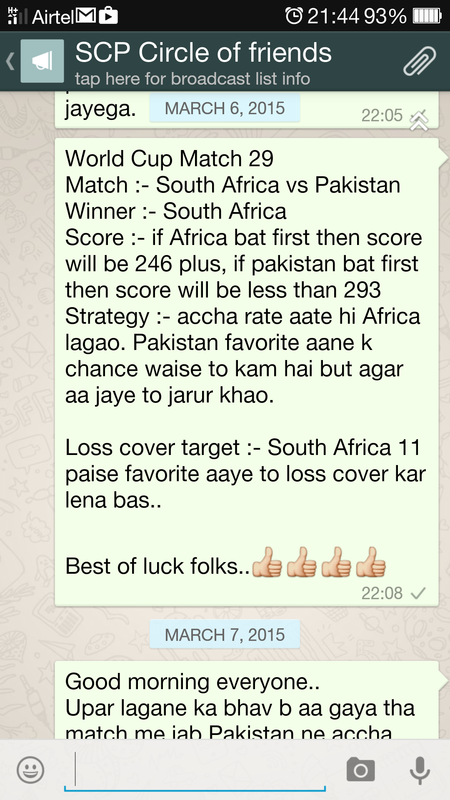 Humne match mein South Africa win ki report di thi aur match Africa ne hi win kiya. Report ka screen shot hum neeche upload kar rahe hain. Aap check kar sakte hain. Isse pahle India vs Zimbabwe, Pakistan vs Ireland aur baki sabhi low odds wale matches mein bhi humari report right rahi thi. ALL REPORTS RIGHTS IN PREVIOUS MATCHES..97% RESULT IN WORLD CUP TILL DATE..NOW 20 THOUSAND FEES FOR WORLD CUP REMAINING MATCHES..
Last kuch days ne humne website update nahi ki thi. 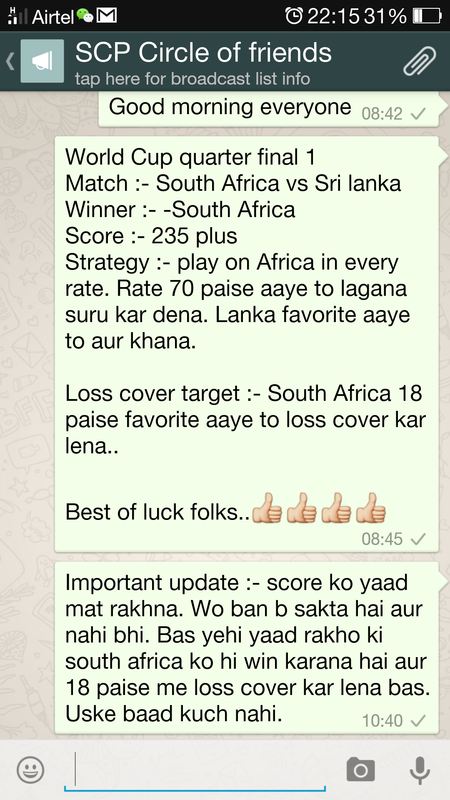 Aaj hum apne last sabhi matches ki reports ki update website par upload kar rahe hain. 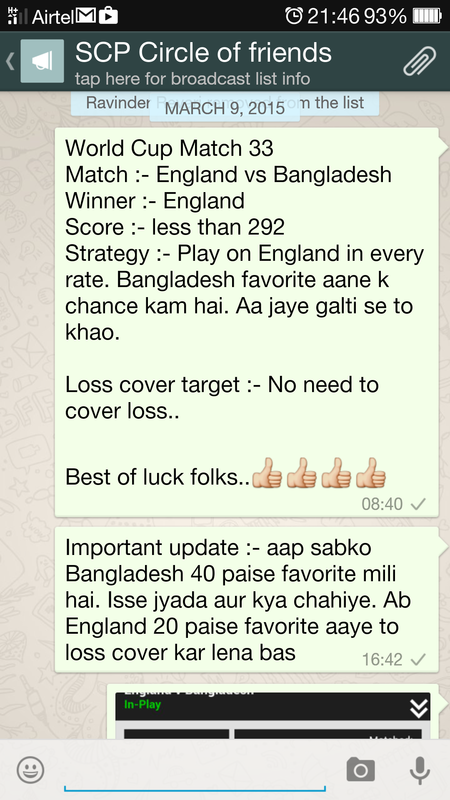 Last sabhi matches mein bhi humari report right rahi hai. Hum sabhi reports ka screen shot neeche details ke sath upload kar rahe hain. Important Note :- Ireland vs Zimbabwe ( Match number 30 ) mein humne koyi report nahi di thi. Iske alawa New Zealand vs Afghanista ( Match Number 31 ), India vs Ireland ( Match Number 34 ) aur Sri Lanka vs Scotland ( Match number 35 ) mein report dene jaisi koyi badi baat nahi thi but score ke sath inme bhi humari report right rahi. Match Number 29 ( 7th march ) Pakistan vs South Africa :- Is match mein humne apne clients ko South Africa win karane ki report di thi. Jab match mein south africa 10 paise favorite aaya tab humne unhe both side barabar plus karne ko kaha aur unhe Pakistan ke jeetne par bhi huge profit mila. 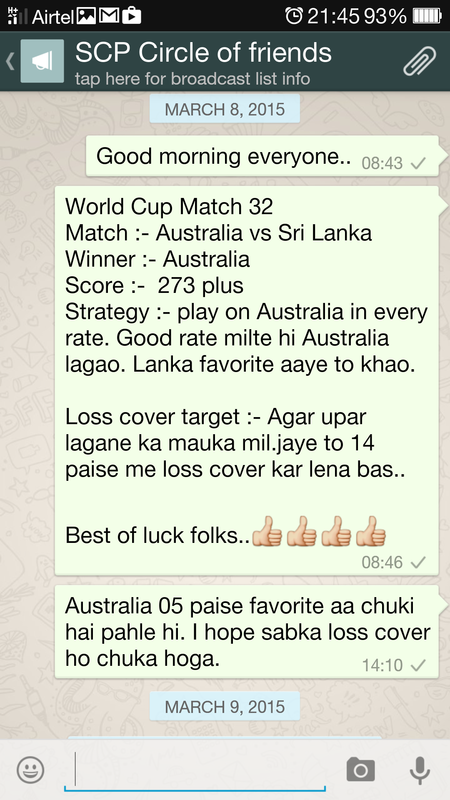 Match Number 32 ( 8 March ) Australia vs Sri Lanka :- Is match mein humne Australia win aur score dono ki right report di thi. 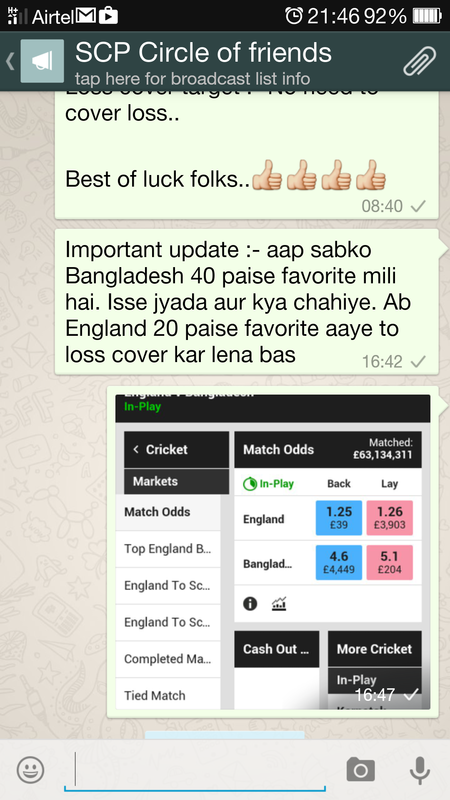 Match Number 33 ( 9 March ) Bangladesh vs England :- Is match mein humne apne clients ko England par bet karne ki report di aur England 24 paise favorite aane par both side plus bhi kara diya. 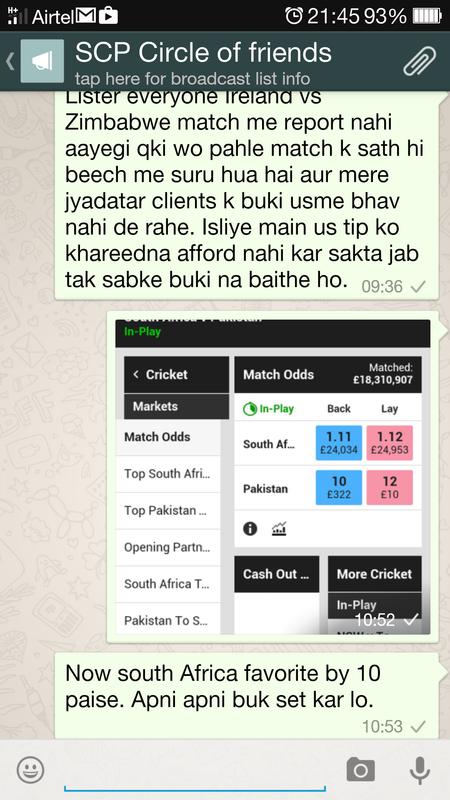 For Membership Call Us On 09540808605..Pls Dont Ask For Demo Or Trial..Now 20 Thousand fees for remaining world cup matches..
INDIA WON AS PER OUR REPORT..95% ACCURACY IN WORLD CUP..NOW 20 THOUSAND FEES FOR REMAINING WORLD CUP MATCHES..
India vs West Indies ke match mein ek baar fir se humari report right rahi. 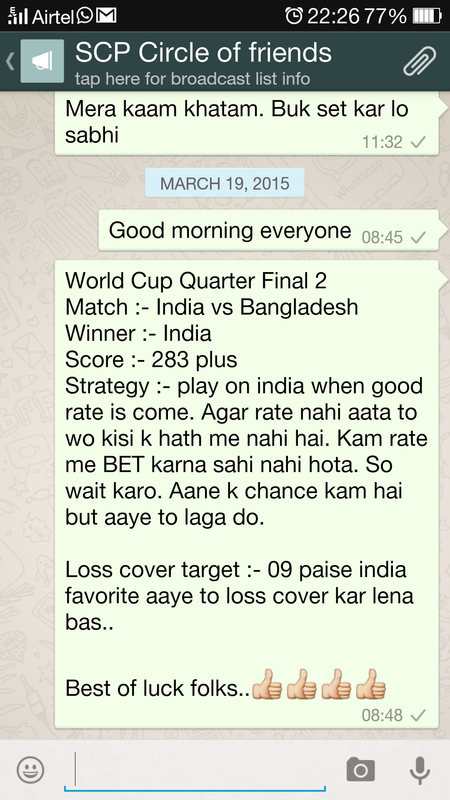 Humne India Win ki report apne clients ko di thi aur match India ne hi win kiya. 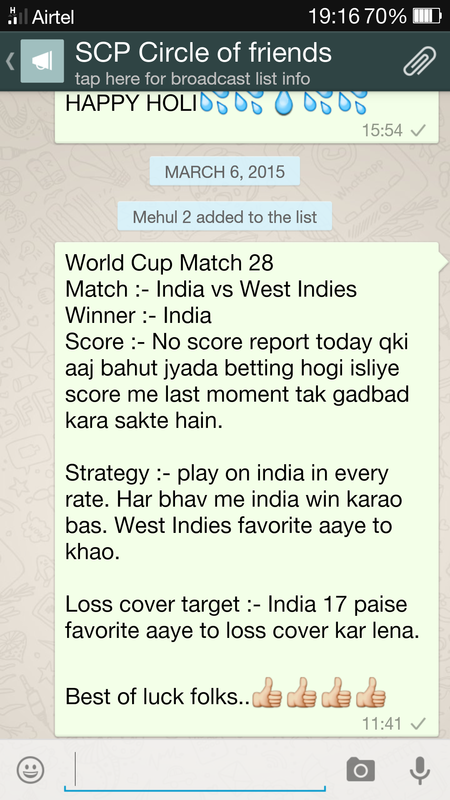 Jabki baki sabhi tipster aur websites ne West Indies win ki tip di thi. Report ka screen shot hum neeche upload kar rahe hain. Aap dekh sakte hain. Important Note :- WORLD CUP MEIN ABHI TAK HUMARI ACCURACY 95% RAHI HAI. HUM AAGE BHI ITNI HI ACCURATE REPORT DENE KI KOSHISH KARENGE. ABHI BHI WORLD CUP MEIN 3 JACKPOT MATCH AANE BAKI HAI. IPL MEIN HUM 15 JACKPOT MATCH DENGE. FOR MEMBERSHIP CALL ON 09540808605..
FEES FOR REMAINING WORLD CUP MATCHES IS 20 THOUSAND..